* Solid polished acrylic mounted to an elegant Rosewood Piano Finish frame. These are truly high quality high end awards with a high sheen. Pictures don't come close to showing the true elegance of these pieces. Each piece is permanently laser engraved. * Included with each order is graphic layout (Including Logos/Graphics), sizing, optional gift message, proof image and engraving. 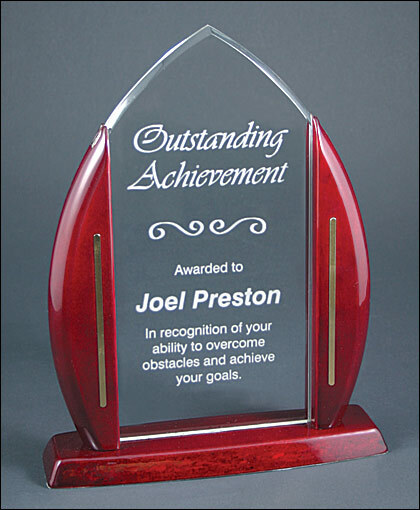 * About the Materials used: The clear acrylic center (3/8" thick) has high sheen and engraves "white". The attached Rosewood piano finish frame holds the acrylic plaque and has a high gloss mirror finish with a gold metal inlay on the sides. Pricing includes all engraving and assembly. * NO CREDIT CARD required to view your proof!. Text: TEXT to be Engraved (Including Poems) - Also specify the placement of the text. Example: Use this "Text" for the top and this "Text" for the bottom. Multiple fonts can be used, please specify which font for which words in the (Special Instructions) section below, actual fonts are sharper. Layout Enhancements: ( Optional ) Add a decorative separator or bracket to enhance your text.